This Vegan Chocolate and Chestnut Cream Cake not only tastes great but is perfect when you cannot eat any dairy or eggs! 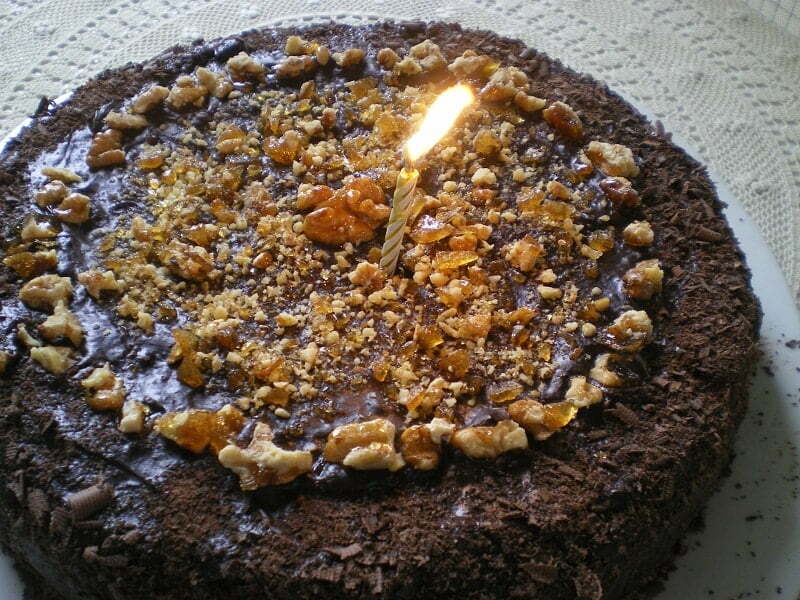 How would you feel if your birthday was during Lent and you could not have a Birthday Cake? Unfortunately this is something I had to face many times as apart from my birthday, my daughter’s birthday is a few days before mine and my son’s is exactly a month after mine, so in all three cases it happens that when the Easter is late in May or early in April, at least two of us have our birthday during Lent. This is my entry for the Click Event, created by Bee and Jai, of Jugalbandi. Unfortunately during all these years when the childrens’ birthday was during Lent I always bought them a cake of course , even if some of us would not eat any, but when it was during the last week of Easter then we would wait and celebrate on Easter day. During this past year I have been experimenting a lot and made a lot of new recipes, so I hope others fasting or Vegans can now enjoy a real Birthday Cake. The pseudo sponge cake was the easy part, so was the ganache and the caramelized walnuts. Actually about the walnuts this was not exactly what I intended to do but I realized that later that when putting the caramel on the parchment paper I should have turned all the walnuts so that the rounded side should be facing up. The difficult part was to make the filling. Verdict: Just perfect. The cream was still a bit sour, but this combination with the chocolate is so good and the crunchy caramel on top makes it irresistible. Preheat oven a 180 degrees C.
Put the fluids (oil, vinegar, orange juice, water and vanilla essence) in a bowl and mix. In another bowl put the flour, sugar, cocoa, baking powder, baking soda, salt and orange rind. Mix the flour mixture and start adding the fluid and mixing until the batter is ready. Line a 26 cm spring form tin with parchment paper and brush with oil. Bake until a toothpick inserted in the middle comes out clean, about 45 minutes. Puree the mixture with a fork and set aside. In a non stick frying pan add the sugar, lemon and water and mix with a spatula. When the mixture starts changing colour to a light caramel, add the walnuts and stir until the mixture turns darker. Remove caramel on a parchment paper and set aside and allow cooling before cutting. Try and cut the caramel and separate from the walnuts. Cut into smaller piece by folding the parchment paper and pounding with a heavy object. In a saucepan combine the water, sugar, corn flour and vanilla and keep mixing until the cream sets. Mix in the pureed chestnuts and mix with a hand mixer to make the cream fluffy. Allow the cake to cool and reverse cake in a platter. With a sharp knife separate it into two pieces. Remove the top part and place again the spring form. Add the cream while it is still hot, add the other cake on top and set aside to cool. In a bain Marie put the chocolate and mix until it melts. Add the margarine and mix and then add the syrup. Pour on top of the cake, while the ganache is still hot. Allow to cool and decorate the cake with the chocolate shavings and the walnuts. I am sending this recipe to my Friend Poornima, of Taste Treats, who is hosting the event For the Love of Chocolate. Wow ivy that is a beautiful and so so yummy delicous cake, wish i had ahuge slice. Ivy, what a lovely recipe and HAPPY BIRTHDAY. With such a great cake, the birthday is even happier. Chocolate and chestnuts is a winning combination. Looks delicious. Happy birthday to the whole family! You did a great job on it! It looks beautiful and delicious! Happy Birthday!! Happy B’day! A wonderful and creative cake Ivy, especially during this Lent period. Ivy, I know how you feel. My birthday is almost always during Megali Evdomada … except for this year as it is right after Easter. My mom would always make a simple Halva but this is a beautiful alternative! I guess there is more that one can do than you would actually imagine with Lenten restrictions. Once again Happy Birthday Ivy! Xponia Polla, Ivy! You’re creativity abounds here and I adore the photo with the wood and chestnuts. I’m sure the cake was enjoyed by all. I’m amazed!!! What a gorgeous cake. I’ve never cooked anything with chestnuts before – never even knew how to prepare them. Very Happy Birthday to all of you…Thats a gorgeous cake, u’ve got to send this for my event too, I would love to have it. Have sent you a msg on bloggeraid. This cake sounds amazing. Your family is lucky they have someone who is so creative.